In brief: Think of Harrod's or Dean and Deluca's, and the basement level of Karstadt will feel right at home for you. 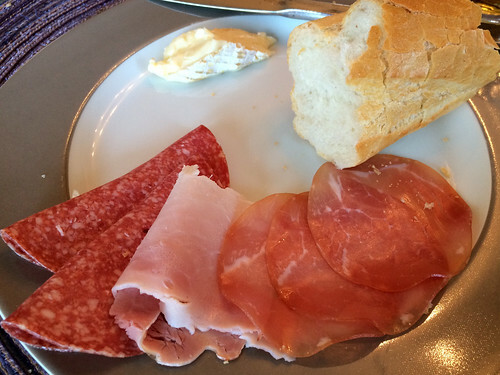 There is no end to the variety of cold cuts and salami in Germany. Across the street from our apartment is a department store and in the basement of that department store, Karstadt, is the most amazing array of cold cuts to choose from. It's not even fancy grocers like Karstadt, but any butcher's or bodega-type store. I could spend days trying everyone and still not get through everything. wow, it's cool, that you are in nuremberg! You can check out "Wurstdurst" near thee "Neues Museum" for yummy Bratwurst and fries with amazing variations of sauces to choose just like green pepper mayonaise or plum ketchup! The perfect place for lunch!